In an industrial space close to the Brussels canal, Denys van Elewyck is hunched over his desk. Over his shoulder, pasted to a bare brick wall is a picture of the Belgian King and Queen in full royal regalia. Queen Mathilde is exclaiming in a cartoon speech bubble “I farted”. King Philippe seems nonplussed. It is a little juvenile, sure. It is also a sprinkling of Zwanze – characteristic Brussels humour most associated with the city’s Marollen neighbourhood. Denys and Samuel Languy, his childhood friend and co-founder of Brasserie En Stoemelings, are no strangers to Zwanze humour; both were born and raised in the Brussels. It’s no surprise then that it has followed them as the uprooted En Stoemelings from the Marollen, trading their one-room brewery for a hangar on the other side of Brussels’ canal. 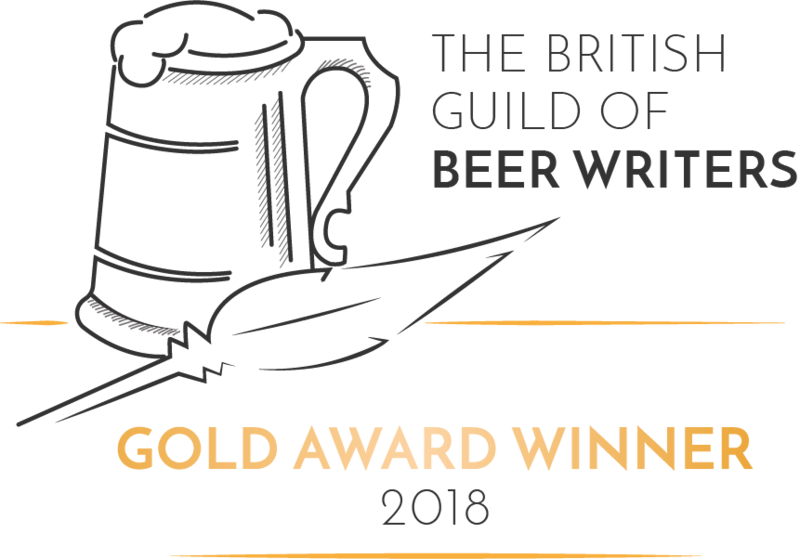 In the twelve months since that move, they have had to rewrite their recipes, relearn how to brew, and reconcile the brewery’s adolescent punkishness with the more professional business they are slowly becoming. 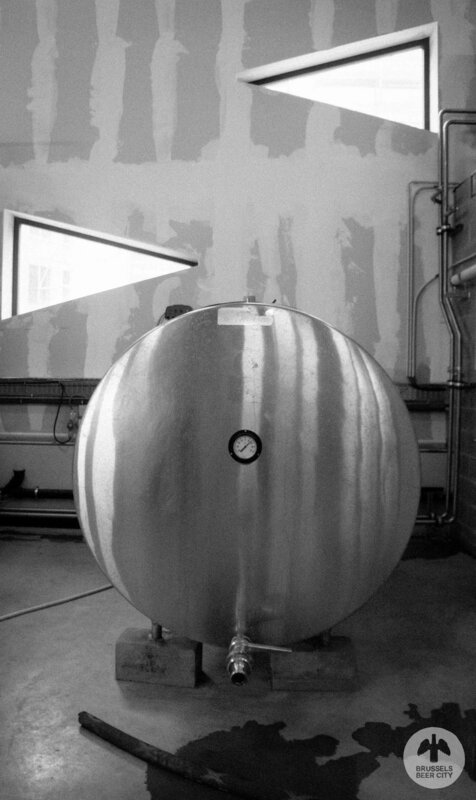 En Stoemelings has always been a brewery of firsts. 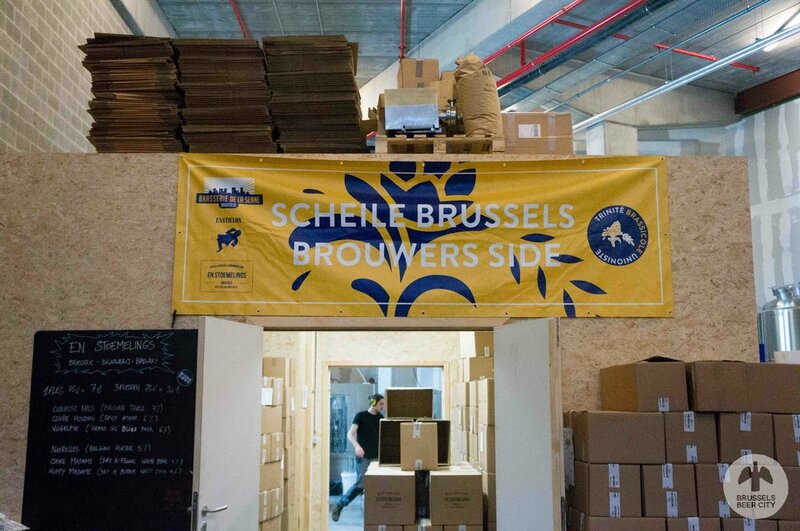 Denys and Samuel were the first of the latest wave of Brussels brewers to open their own brewery, the first one in decades in the centre of Brussels. Now they are the first of this generation outgrow their original home. In late November 2017, Denys and Samuel closed their cramped street-side brewery in the shadow of Kapellekerk train station. They relocated to a new space and a new, purpose-built brewing kit in the Greenbizz eco-business centre in Laken. Their new neighbourhood, straddling the Molenbeek and Laken districts, was already home to their friends at Brasserie No Science, and a short walk away, Brasserie de la Senne’s new purpose-built brewery is slowly taking shape. A 430 square metre chunk of this neighbourhood is now the property of En Stoemelings, and they have filled it with towering stainless steel tanks backed up against bare plasterboard and brick walls. Cardboard boxes are piled high, and the beer list is still scrawled on their old black chalkboard. Hanging above the door to the brewery’s chipboard-lined warm room is an outsized canary yellow banner. It proclaims the “Trinité Brassicole Unioniste” of En Stoemelings, Brasserie Cantillon, and De La Senne, celebrating their mutual appreciation of folksy Brussels football club Royale Union St. Gilloise. Size-wise, it’s a world away from their previous home, which could probably fit into this space several times over. Reaching that level forced them to rethink their beer recipes. Their new brewery kit was capable of squeezing much more out of their hops and malt than the oversized saucepans they were previously used to. “I think we lowered the hops by 50%...It helps you making great beer but, whoa, the yield is unbelievable!” Curieuse Neus, En Stoemelings’ flagship tripel, served as the brewery’s test case, and they took the first couple of months to iterate the recipe until they were happy. The initial efforts were “really bitter, really spicy, and really amber,” Denys says. “The first batches weren’t quite like we hoped, but it’s normal, you have time to adapt…It’s not because we make bad beer.” What they gained in efficiency and scale, they had lost in tactility. “The thing is, when you have tiny kettles it’s easy to see the product, to touch it, you know? It was quite easy to achieve a good recipe,” says Denys. “Since you do not brew so often…you do not experience, experience, experience” the beer as it evolves. After a couple of “really tough” months, by early 2018 they had wrangled the new kit to produce a Curieuse Neus they were proud of. Other beers from their back catalogue re-emerged – Vogelpik, Hoppy Madame, and jasmin-infused witbier Chike Madame. Tanteke followed, a saison brewed with added verbena brewed to celebrate the city’s oldest state-run pawnbrokers, the Mont-de-Piété. Carton Rouge, a limited-run pale ale was brewed for the summer to celebrate Belgium’s World Cup participation. And Papy van de Pils is their latest creation, a collaboration beer with Canadian brewery Blind Enthusiasm, and one that Paul Walsh, publisher of Belgian Beer and Food Magazine, described as “a beer that captures everything that’s good about beer.” They have also dropped hints that barrel-aged beers may be coming. Scaling up production forced the two founders to loosen the reins a little. They have hired additional brewing support and a dedicated salesperson, and include them in the brewery’s decision-making. “We still are the bosses, of course, but we don’t say, ‘We are the bosses’,” says Denys. The new sales position is particularly crucial because the pressure is now on to sell all that extra beer. Brussels will remain their “centrepiece” of their distribution, but they are branching out into Flanders and are exploring export opportunities in France, England, The Netherlands, and Russia. Denys hopes that En Stoemelings’ growth prospects will benefit from a wider range – kegs in addition to 33cl and 75cl bottles – alongside an investment by them in the brewery’s visual identity. The colour-coded labels flying off the second-hand labelling machine are a long way from the pieces of card tied to the necks of bottles that used to pass for En Stoemelings labels. That their client list is expanding is a positive sign for the brewery as it transitions from bedding in to ramping up production. It feeds into their plan to continue sustainable growth, adding new equipment and increasing capacity in line with demand. Their lease at Greenbizz runs for five years, and they have future-proofed the brewery for expansion. If needed, they can use the yawning empty space above their heads to install a second, mezzanine level to accommodate more equipment. Brewing in Brussels is shifting up a gear; almost every major brewery in the city is dealing with expansion issues. L’Ermitage seems perpetually in the process of increasing their capacity as they struggle to meet demand. Brussels Beer Project will be opening their own full-scale production brewery by 2020, bringing all of their production in-house. And Brasserie de la Senne will go through a similar discomfiting period of adaptation when their new brewery at Tour & Taxis opens sometime in the next year. These brewers will no doubt be watching to see how En Stoemelings’ strategy plays out in an ever-more-crowded beer market. At En Stoemelings they are too busy making and selling beer to worry too much about this. helping them in this endeavour is the makeshift bar they have installed opposite the brewery’s entrance. Before their move, they had been adamant that the new brewery would focus on production. But people just kept coming to buy beers from them – tourists and locals alike. So Denys and Samuel built a makeshift bar at the entrance. It’s another channel to sell beer, but more than that it’s a way to keep alive the spirit of the Marollen in this Laken outpost. “At first we weren’t sure, you know? And I was like, ‘Yeah, come on over’,” says Denys. “You can kind of re-find the enchantment that we had at the previous place. “And you can expect to have the En Stoemelings welcome.” Zwanze and all.